And who are the criminals? Some are the same politicians who, like Donald Trump, jump before the cameras to assure the public that everything possible is being done to protect them, when in fact the forces of government are doing the barest minimum. Others shy away from publicity — like the multibillionaire oil and gas magnates who have amassed huge fortunes over the decades promoting the very technologies that have warmed the planet and made such disasters inevitable. In plain words, they lied to the people. And the people are those who suffer the consequences, not the very rich who can jet to wherever pleases their luxurious lifestyle. “Minor environmental gains.” How ironic and telling that Hurricane Harvey, which has now dumped up to four feet of rain on parts of Texas and Louisiana since Aug. 25, is hitting the very states where the oil companies control the political structure lock, stock and barrel. 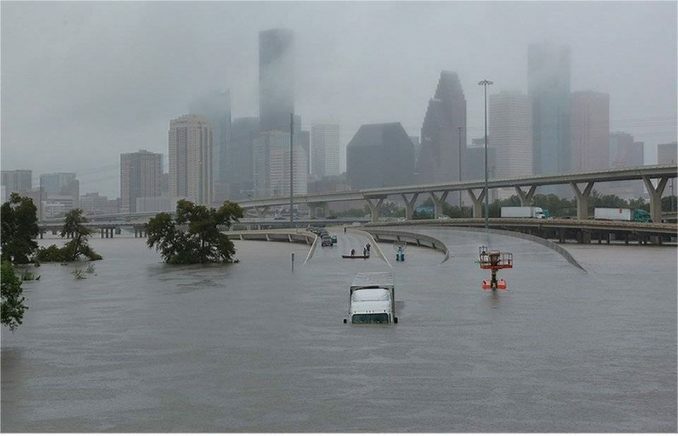 The billionaire owners of these companies should be behind bars — in the very jails that are now under water in Houston and other cities. Scientists cannot say a particular storm is caused by global warming. There have always been hurricanes and floods. But they emphatically confirm that the increase in severe weather events now being experienced around the globe is caused by warmer temperatures. The article predicted “intense thunderstorms” would follow. Indeed they have, and much more. The cataclysm of global warming is a live-or-die test of the capitalist system, which puts profits for the ruling class before everything else. And there is no question that this social system is in critical condition. 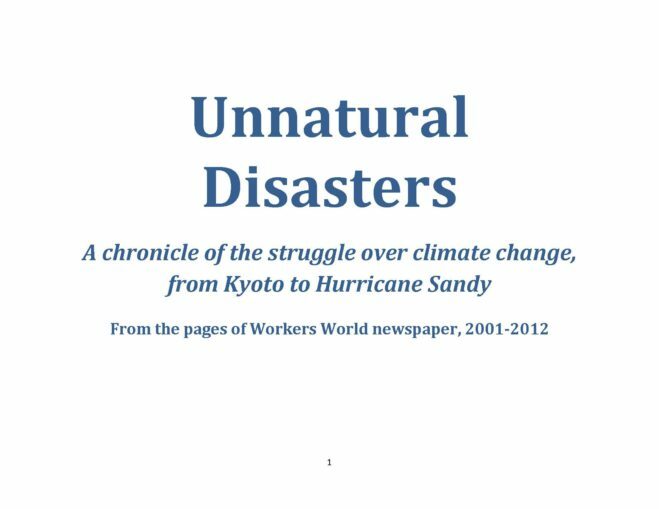 The proliferation of wars and “natural” disasters around the world attests to this fact. Moreover, the seemingly unstoppable widening of the gap between rich and poor has reached the point in the U.S. where the richest 1/100th of 1 percent now account for almost all the gains in income. Thousands of ordinary people — not the 0.01% — have volunteered their time and boats to help the people of the Gulf Coast escape the rising waters. It is commendable, but it also shows what is lacking: an organized, massive response to a disaster situation that requires planning and the allocation of great resources. That hasn’t happened. Is it a problem of resources? Hardly. What this country really needs is not more nuclear weapons in order to impose imperialist terms on the rest of the world, but an all-out plan to combat global warming. That’s already responsible for so many deaths from hurricanes, heat waves, torrential rains, flooding, mud slides — and it is only intensifying. The answer of the Trump administration? Pull out of the Paris Accords, which were weak to begin with, and deny that climate change even exists. The country that boasts of “leading the world” is the biggest drag on human progress. The U.S. economy has way, way overgrown this profit-motivated capitalist system. The ownership and control of the vast means of production by a handful of billionaires are completely incompatible with a globalized economy in which the labor of hundreds of millions of workers contributes to the making and distribution of every product. Capitalism is a reactionary, self-destructive anachronism that must be shattered. Socialized ownership of the means of production is necessary if we as a species are to take control of our destiny. We have the knowledge and the means to plan for an infinitely better world. What we need is a movement independent of the corrupt political machinery that has imposed the rule of the very few on the many. Central to this movement — and this is not theoretical; it is happening as we speak — is the uprising of the most oppressed. Young people especially — so many of them Black, Brown, Indigenous, women, LGBTQ gender nonconforming, people with disabilities, immigrants — are shaking the pillars of white supremacy, racism and patriarchy and tearing down its symbols and statues. They are the forward edge of the working class in this country. And that is the class that potentially has the power to bring down capitalism and replace it with a system based on social ownership and control of the productive forces. Socialism. For so many millions, the red-baiting that was the mainstay of the capitalist political establishment for a century or more has lost its potency. The disaster on the Gulf Coast will accelerate the sea change that is shaping a powerful new social movement — not for reform of this stinking corpse of a system, but for revolution.